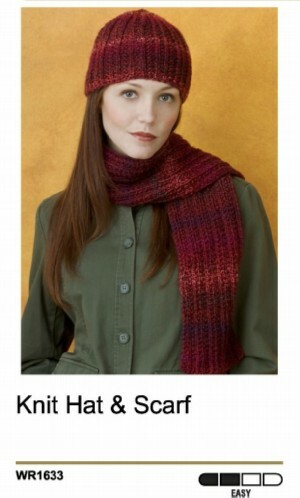 Many knit scarf patterns are just perfect for the beginner and make an ideal gift. These are quick and easy knitting projects that can be made up in no time. Hat fits most women. Scarf measures 7 1/2" wide x 54" long. RED HEART® "CollageTM": 2 Balls 2352 Crimson Maple for scarf, 1 ball 2352 Crimson Maple for hat. Knitting Needles: 5.5mm [US 9]. Yarn needle. GAUGE: 20 sts = 4 ; 24 rows = 4 in pattern. CHECK YOUR GAUGE. Use any size needles to obtain the gauge. Hat Circumference = 20 . Row 1 (Right Side): K3, * P3, K3; repeat from * across. Row 2: P1 , * K1, P1; repeat from * across. Cast on 39 sts. Work even in pattern for 54 . Bind off. Weave in ends. Row 1 (Right Side): K3, * P3tog, K3; repeat from * across 67 sts. Rows 2, 4, 6, 8, and 10: P1, * K1, P l; repeat from * across. Rows 3 and 5: K3, * P1, K3; repeat from * across. Row 7: K3tog, * P1, K3tog; repeat from * across 33 sts. Row 9: K1, * P1 , K1; repeat from * across. Row 11: K1, * K2tog; repeat from * across 17 sts. Row 12: Purl. Row 13: Repeat Row 11 9 sts. 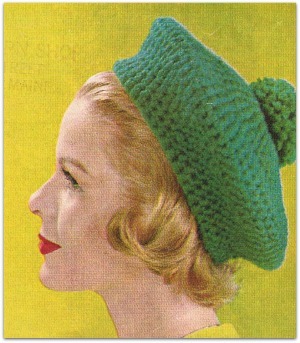 Row 14: Purl. Cut yarn and thread end into yarn needle. Weave through last 9 sts; draw up firmly; fasten securely. Sew back seam of hat. Weave in ends.